It’s estimated that within five years, more people will be connecting to the Internet using mobile devices than on desktop PCs. 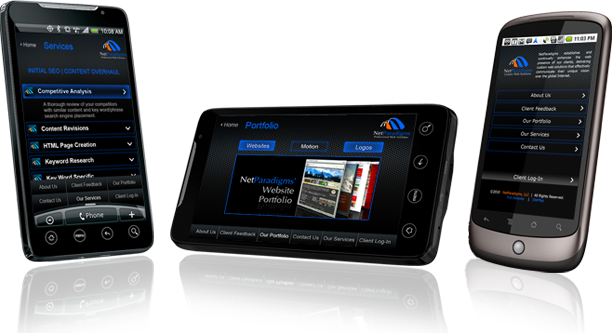 NetParadigms offers iPhone® and iPad™ custom mobile web solutions so you can effectively communicate your vision using the latest custom mobile web technology and meet your users where they are. Our customized mobile web solutions help you capture mobile web traffic and direct users to a uniquely tailored mobile web environment. In addition to iPhone® and iPad™ mobile web customization, NetParadigms also offers custom web solutions for other mobile devices outside of the Apple/Mac family. Why you need a Droid optimized website? More and more, we are seeing a current rise in the use of Droids and other smartphones that many people utilize to access the internet. About 60,000 Android phones are sold daily, which is about 22 million Android phones per year. This gives us an idea of how popular the Droid phone is. Many consumers depend upon their Droids to do the things they would normally do on laptops and PC’s. They are used for emailing, searching the web, networking with others through social media, and doing online commerce. As a business owner you want to be up-to-date on your marketing options! Mobile marketing is certain to beat the Internet, TV, radio, print, and billboards. If you don’t have a Droid optimized website already, you may be losing a large number of possible clients. Mobile internet browsing is estimated to actually exceed normal PC internet browsing. 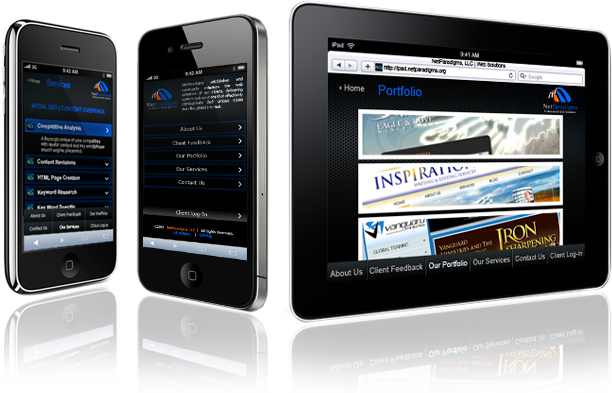 If you currently don’t have a Droid website design, then you are not being accessed by many of your potential clients. In our day, we are seeing a current rise in the use of mobile devices that many people utilize to access the internet. More and more consumers rely on their mobile devices to do the things they would normally do on laptops and PC’s. They use them for emailing, searching the web, networking with others through social media, and doing online commerce. Google has a separate index for mobile content. Google now has separate indexes for both traditional web content and mobile content. If you have added your mobile site to Google's mobile index, you will have a better likelihood at showing up in search results than a site without a mobile optimized design. In addition, these two different indexes should lessen any concerns of potential duplicate content issues. Your regular website will not be sufficient anymore. Simply stated, websites that are designed for traditional web browsers are not going to be viewed well on mobile browsers. The screen sizes on mobile devices are clearly much smaller and also come in a number of different shapes. Your mobile web design should be a more basic version of your main site with only necessary information. A fifth of Americans today access the internet via mobile devices each day. This number is astonishing and will continue to grow. Mobile phone technology has grown at an accelerated rate and will continue to do so. Additionally, the prices of smartphones and data plans are falling every year and so more and more people are able to afford them. $1.6 billion was spent via mobile devices in 2009. Mobile commerce seems to be yet another aspect of mobile web browsing that has only begun. This number, which is already rather momentous, may skyrocket over the next few years. People are making more and more purchases on mobile devices when they are on the go. A few of the companies that have good mobile site designs include Papa John's Pizza, Amazon, Bank of America, Facebook, Twitter, Digg, and more..